October 5th this year marks twenty years since the adoption of the flag of the Republic of Macedonia. Created in a very complex and difficult political situation, it bore a great burden from its birth, the burden of the inevitable resistance to it, as a result of the pressure to change the state flag at all. Aware of this difficult situation, Dr Miroslav Grcev, the man who was entrusted with the task to create a new flag, against expectations to create an original and never-before-seen design, he went looking for a new sun in graphic stylizations that are nothing new in the vexillological and heraldic language and thus will try to reduce the expected resistance. So, he will come to a solution for the flag with a sun that will be a symbolic and identity continuation of the ‘Star of Kutlesh’ and the five-pointed star from the previous state flags, and of the sun from the coat of arms, which has the most similarities in the graphic stylization. As a reminder, all details about the entire process of creating the new flag Dr Grcev wrote in issue 5 of ‘Macedonian Herald’. Thus, in 1995 ‘the new sun of liberty’ (verse from the national anthem) was born. Some people denied it, others considered it imposed, and others mocked and called it ‘air fan’… But in all these twenty years, that was the flag under which major sport victories were won, world mountain giants were conquered, and many even gave their lives. It is the flag that usually serves as a symbol for the Republic of Macedonia, in the absence of a heraldic coat of arms. From it, the coat of arms of the President of the Republic of Macedonia emerged. Fortunately, as years go by, so the love and respect for the national flag grows. Citizens increasingly identify with it and proudly wave and display it. This is particularly noticeable among younger generations that are not burdened with the mentioned political burden that the flag bears. For them, it is not a ‘new’ flag. It is, simply, the flag of the Republic of Macedonia. A major role in the growing acceptance and respect for the flag played the ceremonial changes of the flags in front of the Assembly and the Government of the Republic of Macedonia and the residence of the President of the Republic of Macedonia. 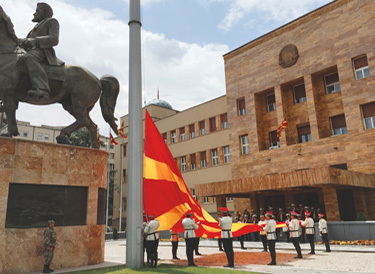 Since 2010, members of the Battalion of Honor and the military orchestra of the Army of the Republic of Macedonia started a project of ceremonial changing of the flags in front of the state institutions. In addition, a prominent role played the setting of 30-meter flagpoles that proudly wave the flag at over 50 locations throughout the country. From vexillological perspective, the flag of the Republic of Macedonia is always among the favorite flags of the world vexillologists, and they always talk about it with sympathy. However, let us not forget that the flag lacks an official and precise construction sheet and more importantly – it lacks color definition. These are two vexillological inconsistencies that should be resolved as soon as possible. But, despite all of the burden and all of the inconsistencies, one thing stays certain – the flag of the Republic of Macedonia is wonderful! And we should all proudly display and wave it. 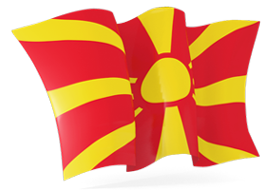 Happy 20th anniversary of the flag of the Republic of Macedonia! Long may it wave! This article was published in ‘Macedonian Herald’ No 9.